History/Mythology: The Shiva Lingams come from the Narmada River in India, these stones are naturally formed through tumbling in the rive. Once a year the stone are gathered in a ceremony and then hand polished. According to the ancient Sanskrit Shiva Lingam which means ‘sign’ or ‘symbol’ is the symbolic sign of the Divine Creative Manifestation. The Shiva Lingam shape is a manifested representation of the Shiva, the Lord of Creation according to Indian beliefs, while the markings on the Shiva Lingam are the symbol of Yoni the feminine energy that creates and fertilizes the on going balance in the universe. It is believed that all Shiva Lingams are connected and that the user can join the grid in order to tap into the universal information. There are theorizes that due to the small area that these come from and the iron oxide content in the Shiva Lingams that the Narmada rive had a meteorite come down and impact millions of years ago. 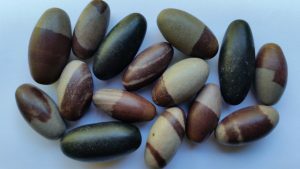 Shiva Lingams are a very grounding stone that assists you to connect with the universes and help to connect with both male and female energies equally, it is an especially powerful energy generator and cleanser when used in meditation. This allows the user to tap into the dive knowledge to obtain insight and direction (when the user is ready). A Shiva Lingam helps to awaken your energy centers and rise and your Kundalini energy. Healing –Balances fluid of the body, alleviates back pain and assists alignment of the spine. Increases fertility and relieves menopausal and prostrate disorders. Can be used in all meditations particularly when clearing blockages. Great to use in times of depression and facing issues to find life purpose and direction. Used to help raise your Kundalini – please note that this is something that should be taken with great preparation.